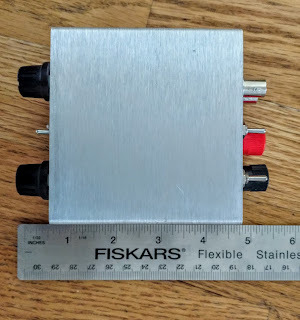 I was looking for a QRP tuner for the 1Watter 40m transceiver I am building that would work with both balanced feedline antennas as well as coax feedline. 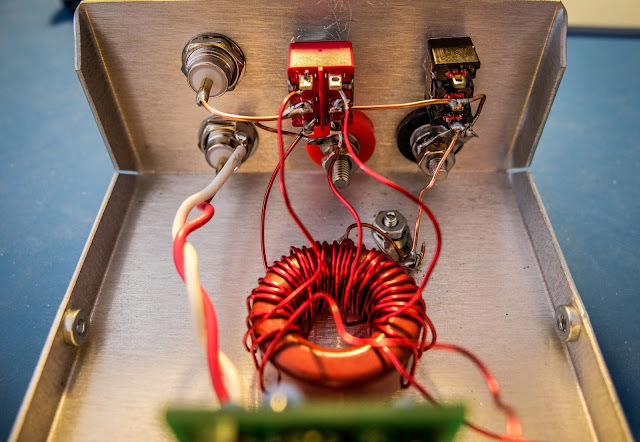 The traditional Z-Match tuner is quite efficient at tuning balanced line antennas and the built-in SWR bridge gives you an all-in-one tuner and SWR indicator without having to take a separate SWR meter along with its inherent mess of cabling a separate SWR meter. The BLT in the name stands for "Balanced Line Tuner". 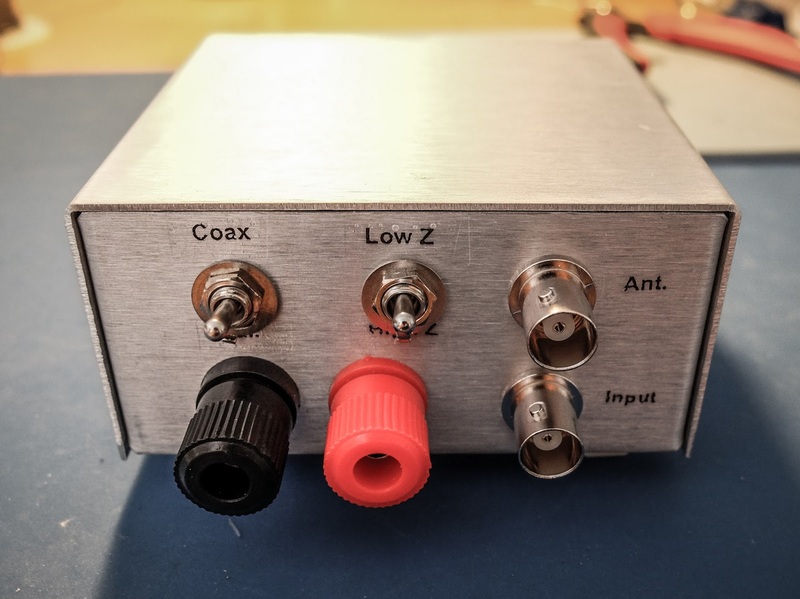 This tuner kit is available from the fine folks at Pacific Antenna. The kit comes with everything you need except for hookup wire and your soldering equipment. Instructions are downloaded from the qrpkits website. Why use a z-match ? Matches balanced loads without the use of lossy baluns. Being a parallel resonant circuit, the Z-match can provide some band-pass filtering for your receiver and harmonic attenuation for your transmitter. 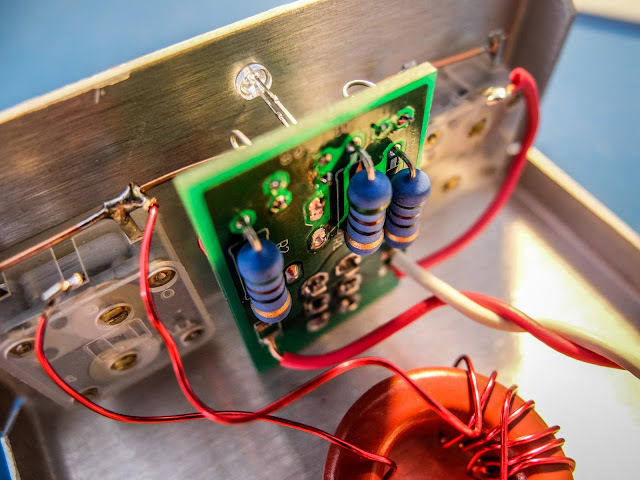 A well-designed Z-match tuner has a high Q and is more efficient (less lossy) than other types of tuners. 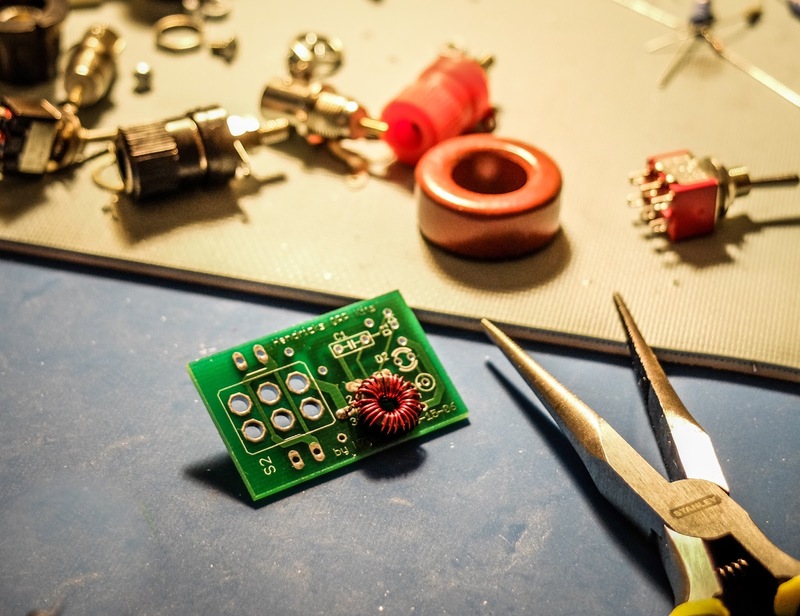 The fixed inductor simplifies construction (no taps or rollers needed). Matching balanced line fed antennas is sometimes problematic for a traditional balun and tuner as the antenna can present impedances that are far outside of the balun's design. 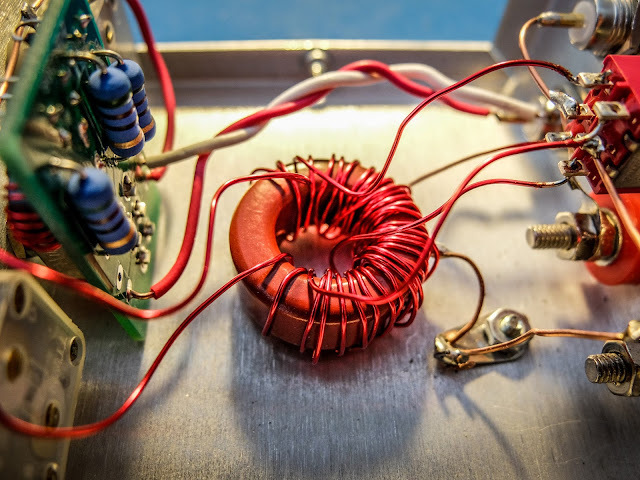 The Z-Match uses a center tapped coil to keep the complex impedance balanced across the inductor (at least that's how I understand it). 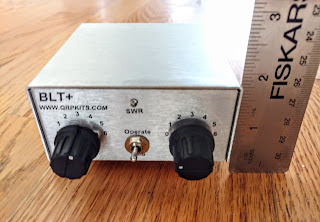 I have measured my Elecraft BL2 balun getting appreciably warm at QRP levels when connected to my doublet indicating loss I'd prefer to avoid. The Z-Match design supposedly results in less loss. 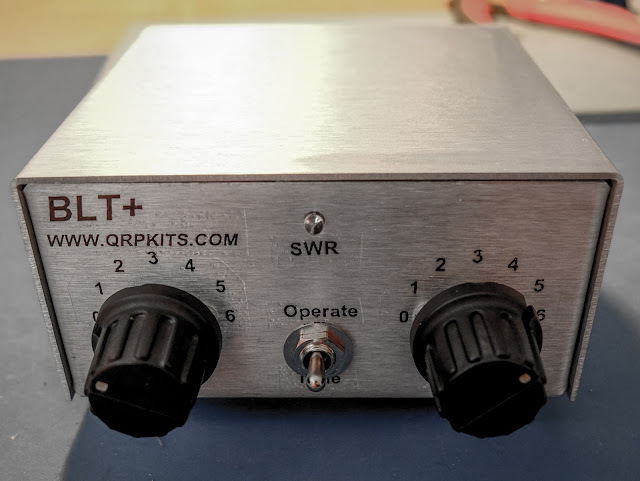 The BLT plus includes a Dan Tayloe N7VE LED SWR indicator which eliminates the need to carry a separate SWR meter. The concept is beautiful. The SWR bridge is switched into "Tune" mode and presents a 50 Ohm impedance to your transmitter while you are tuning so that you don't risk damaging sensitive home-brew finals. The LED lights when the SWR is too high and dims and then goes out as the match is made. It is simple and fast to use. The instructions for the bridge are not with the BLT instructions. Download them from this link. The kit is provided with really nice water slide decals that give it a commercial look (if you don't ruin them like I did). The instructions recommend applying a clear coat to the decals after they are applied. I used a Krylon matte finish clear coat which indicated it was fine for metals and plastics but it partially melted the decals and caused them to bubble. I'd suggest testing whatever you are going to clear coat them with first. Don't over tighten the plastic tuner shafts or you won't be able to slide the knobs on (yes I did). The binding posts have little plastic spacers that separate and it isn't obvious. If you install them and wonder how they don't ground themselves (like I did) you've done it wrong and will have to go back after it's together and try to remove them with all the wiring in place. The bolts for the binding posts are very soft metal and the nuts can strip them if you apply too much force (yep I did that too). The main toroid has three sets of windings and they overlap. Pay attention to the instructions about winding them all in the same manner (clockwise or counter clockwise) or you will have to rewind them (yep, I did that too). The 3 windings on the main toroid overlap so you won't be able to go back and verify your turns when doing the 2nd and 3rd winding so count carefully (ask me how I know). 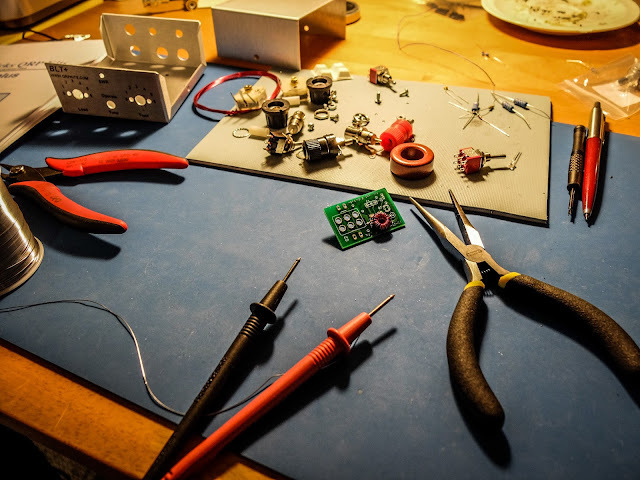 Temporarily attach the SWR bridge to the front panel to get the spacing correct to solder the LED leads. 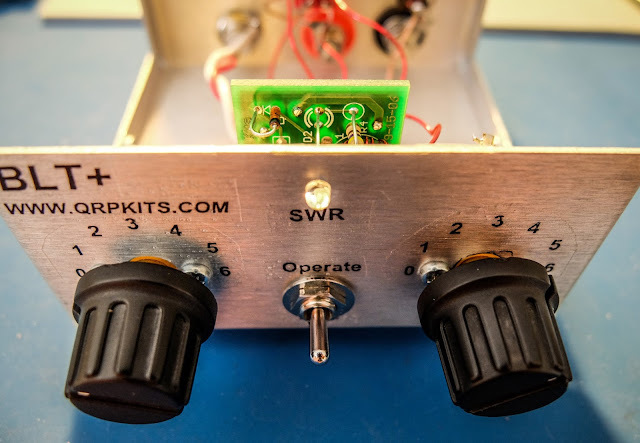 The SWR bridge instructions are separate from the kit instructions and simply googling them will give you instructions for an older version. Use the version here. 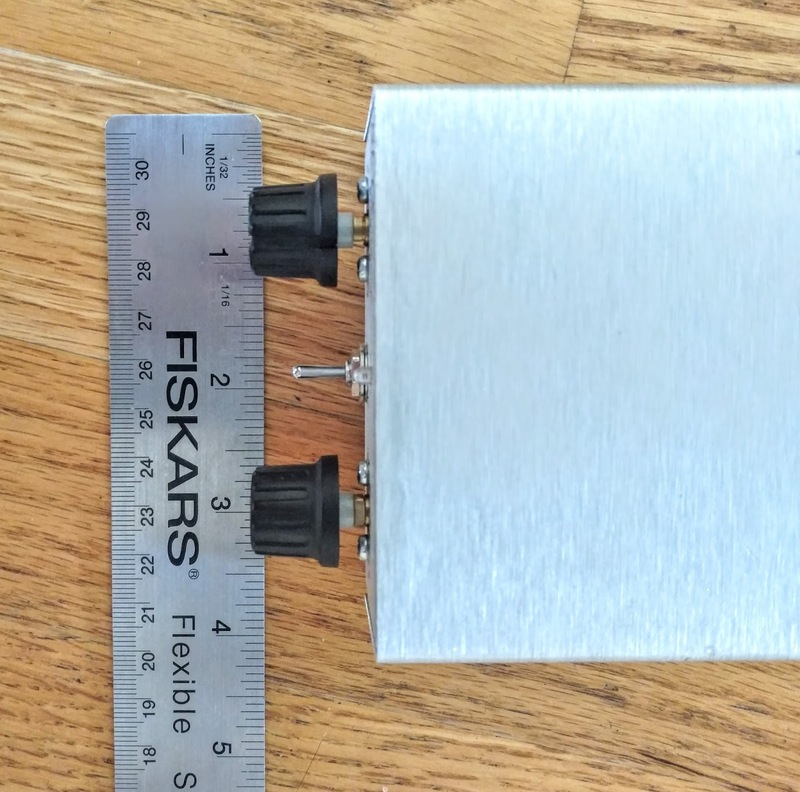 My tuner toroid ended up being a bit messier than I'd like because I had to rewind it and my resulting leads aren't as short as they could be. I may go back and trim the leads to make it tidier but my least favorite part of winding toroids is heat stripping the insulated magnet wire so I'll probably leave it as is. Initial tests indicate it's working great. 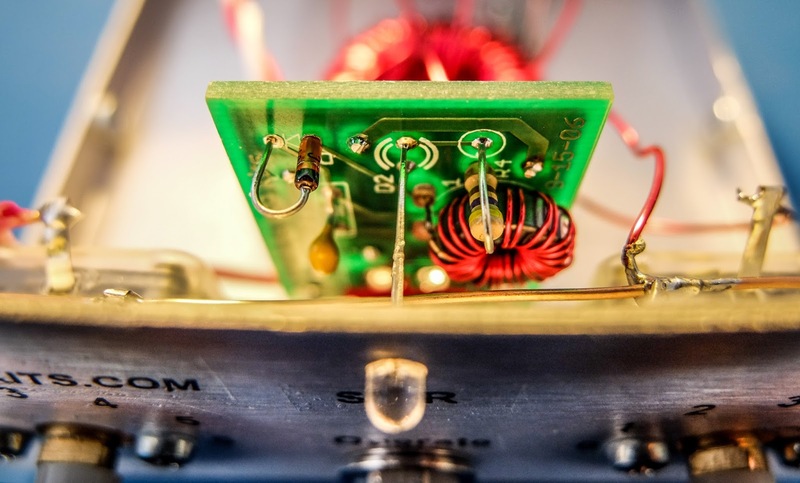 Connect your transmitter and antenna. 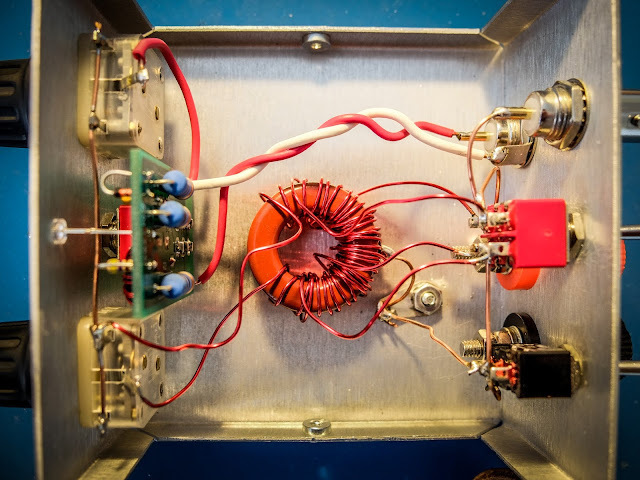 Choose the appropriate switch in the back for coax or balanced line antenna (Up for coax, Down for balanced line). 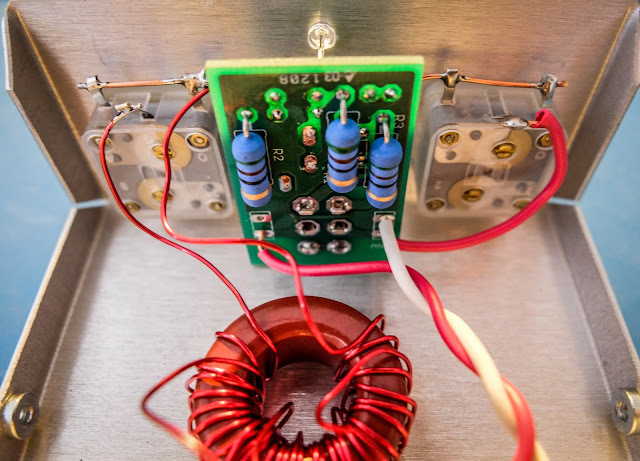 Start with the inductance switch on the back set to low-impedance (Low-Z) because it is the most efficient. It uses the 6 turn secondary rather than the 12. Switch the front switch to "Tune"
Qrpkits offers a great little kit that results in a commercial looking product. You end up with a small portable tuner plus SWR indicator that reduces the complexity of your portable operation. Pacific Antenna is very responsive to questions. I sent a question concerning the incorrect instructions I'd downloaded for the antenna bridge and James answered me the same day with a different link (included above). 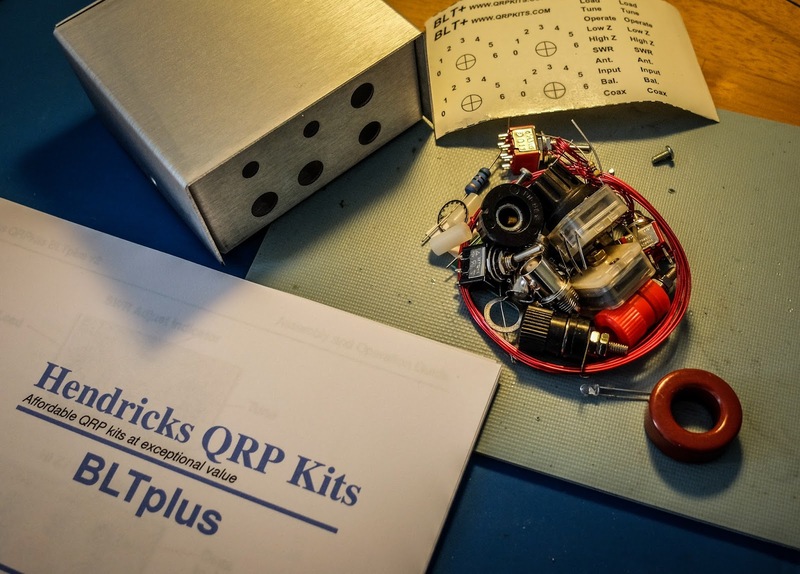 So if you have a QRP radio that needs an antenna tuner I recommend this kit. It's well thought out and works well.